This will be a short discussion on some changes occurring that we think everyone is going to enjoy. The next stop on our Journey for Destination Linux is Twitch! . . . and YouTube live. 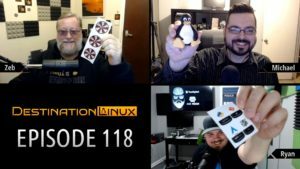 We hope this brings a larger audience into the Linux world and provides more opportunity for people to participate in the show. Patrons will still continue to get the interviews early, when possible. The live recording on Youtube and Twitch will not remain on the site after the show is over. However, Patrons will get a link to the archived live shows if they would like to go back and watch that version. To respect our guests and continue to allow them to make announcements that aren’t yet ready for public consumption we will not be streaming live shows with the guests. The exception will be Patrons who can join us via Zoom as always. We will be recording the shows on Sundays and they will now be released on Fridays instead of Mondays. This will allow us enough time to edit the episode for release.